The hosts (George and Julia) were very very warm and accommodating. 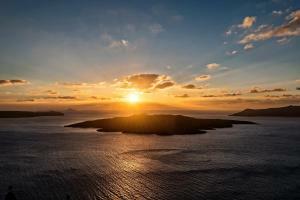 They also provided abundant lot of tips for enjoying Santorini. The hosts recommended Chris to be our tour guide, which turned out to be very satisfying to us. Chris has a deep knowledge about Santorini (history, places, and good spots for photos), has very good command in English, and very friendly. Shared balcony on top of the hotel provided us with a very awesome view of the island. Breathtaking! Aroma suite is conveniently located with amazing balcony to watch sunset everyday! George and Juiliana are great hosts! They welcomed us and upgraded our room! Throughout the stay, they offered very insightful tips for places to visit and eat around the island (non-touristy places) Most important of all, I’m grateful for their kind hearts to take care of the cats who occasionally show up for some food! For your awareness, cats on Santorini Island have a difficult time surviving during the low tourist season (November to March) due to harsh winter weather and low volume of tourists. When you come visit, please spare a little time of yours to feed some of these small animals - they are homeless but simply just need some loving and food! Wonderful location and staff! Perfectly located and a great view. The staff helped us get transportation tour around the island which was awesome. Everything. The experience was unlike any other place I have ever seen. George and the other staff made us feel like home. We arrived early and George told us to drop all the luggages at reception and explore the place and when the room was available, he moved all our stuff in there. He even waived off the breakfast charge for us! Everybody was super nice and the view was brilliant! I will go back to Santorini and I will be staying at Aroma suites again! Resort ordered a driver for the airport and bag pick-up. Plus complimentary coffee and cake. Every staff member was excellent, from check-in to check-out! And they were really genuinely warm and welcoming, like it was their nature - not just their job. View from our balcony was awesome and where we liked to spend a fair amount of time. It is a "shared" balcony, but we usually had it to ourselves. Our room was so clean upon arrival and throughout our stay!!! The balcony and shared spaces were also kept very clean! Would definitely stay here again if we come back to Santorini! Thanks from The Olsons! The location is amazing! Right up the hill from the busy streets of Fira. Enjoy a quiet, relaxing sunset from your balcony and then walk down the hill to enjoy great nightlife, food, and shopping. The staff is very helpful and willing to answer questions and provide tips. The room is extremely clean and the bed is the most comfortable one we had on our trip. The shower is huge! It was perfect and romantic for our honeymoon. The view was incredible! And, the staff were wonderful. The service was seriously phenomenal! George, Mr. Fanis, and their staff are top notch. They go above and beyond tom make your stay with them one to remember. They handled everything for us and gave amazing recommendations on things to do and places to go during our stay. Our apartment was amazing and offered one of the best views on the entire island! We felt like we were on a movie set or in a dream. We highly recommend staying with them in Domino's Residence! Lock in a great price for Aroma Suites – rated 9.1 by recent guests! 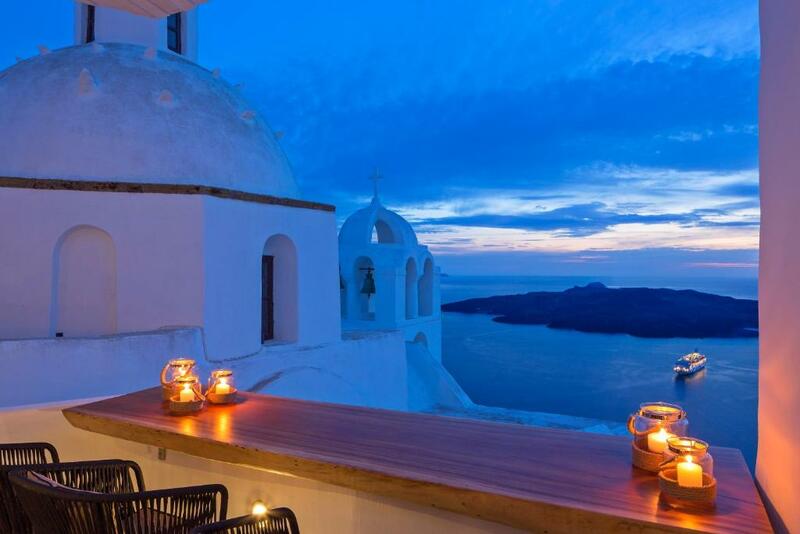 With stunning views of the volcanic island of Nea Kameni and the Aegean Sea, this little hotel is in the center of Fira, 300 feet from the cathedral Church. 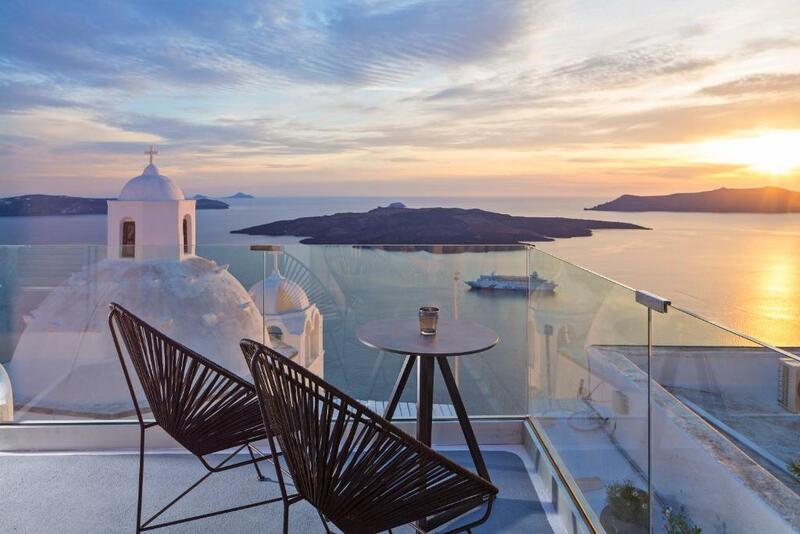 Built in the charming style of Cycladic architecture, Aroma Suites provides a serene, quiet haven for relaxation on the magnificent island of Santorini. 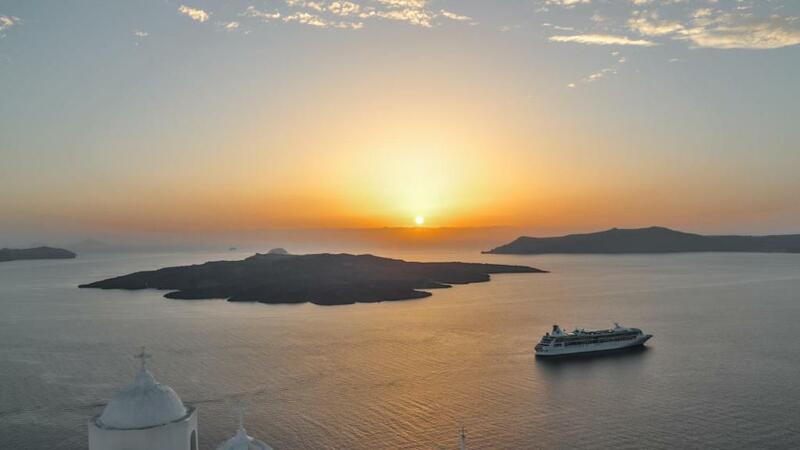 Each apartment or room has its own small terrace or yard from which one can see the volcano, the deep blue waters of the Aegean Sea and the magnificent sunsets Santorini is so famous for. With gentle lighting and vibrant joyful colors, rooms are clean and simply decorated to themes of herbs or spices such as Lemongrass and Spearmint. All rooms have air conditioning and balconies with wonderful views. Guests have the opportunity to use the swimming pool of the partner hotel, just 150 feet away. Free Wi-Fi is also provided throughout Aroma Suites. When would you like to stay at Aroma Suites? -shared balcony with Caldera views. 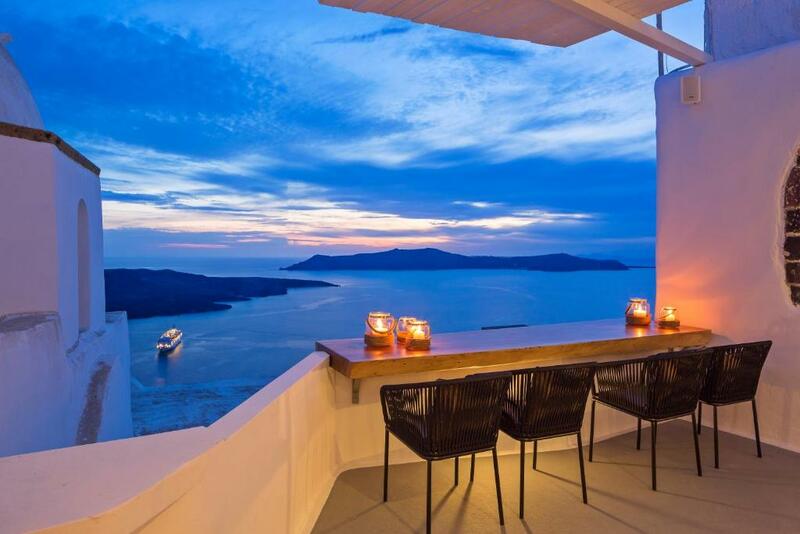 -shared balcony with Caldera view. This double room features a balcony with unobstructed Caldera and sunset views and includes bathrobe and air conditioning. Offering panoramic views over the Caldera and the volcano, this suite has an outdoor hot tub. Please note that this suite is 984 feet from the main property building of Aroma Suites. Aroma Suites is situated in Fira at the edge of the Caldera cliffs. This beautifully appointed hotel features uninterrupted panoramic views of the Caldera, Volcano, Sunset and Aegean Sea. 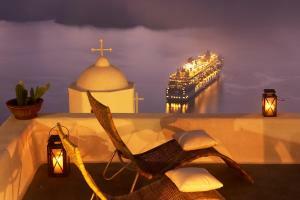 Built on different levels, it follows the traditional Cycladic style of the islands. Aroma Suites has the perfect location since it is situated on the quietest part of the Caldera - although only 100 meters from the town center, it offers the tranquility you seek to fully unwind & relax while on holiday. Aroma Suites is ideal for Couples, Families, Friends, Business Trip. The hotel is also ideal for romantic and unforgetable moments. Your dream could come true at the magical caldera's sunset, our expiriensed staff will help as much as possible for your most pleasant and romantic memories. We are a very helpfull team and always available to give you any information about the island. Our main goal is to provide you a residence which will be an unforgetable experience for you and your loved ones. House Rules Aroma Suites takes special requests – add in the next step! Aroma Suites accepts these cards and reserves the right to temporarily hold an amount prior to arrival. Transportation to/from airport/port is available upon request. Guests are requested to inform the hotel of their estimated arrival time if they would like to use the shuttle service. This can be noted in the Special Request box during booking, or by contacting the hotel using the contact details found in the booking confirmation. Charges may be applicable. Please inform Aroma Suites of your expected arrival time in advance. You can use the Special Requests box when booking, or contact the property directly using the contact details in your confirmation. Not view from the room. Very good mattress ! And very good shower ! Very cosy and amaIng experience!!!! We had a cave room and it was perfect. Great spa, very spacious, quirky and unique. 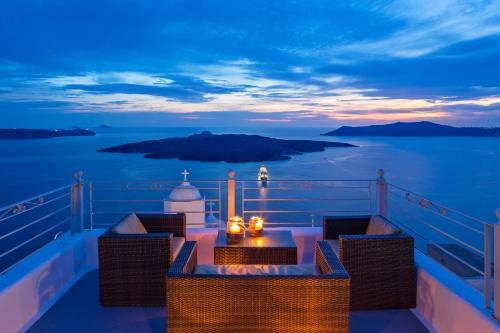 i like the balcony of the suite as there has good view of sunset and you can sit comfortably to watch it. Rooms are a little small. Stayed in Caldera view. Breakfast could have been complimentary. It’s a little hard to find it if u use the google map. The host is very nice. They have a wonderful view. The lighting in the room can be brighter. Good to have a microwave in the room. Overall room was comfortable. Hotel close by to restaurants. We were there during new years day, where most shops were closed for the holiday. Host George was very helpful in providing information on places of interest to visit and helped to book a cruise tour for us. Thank you also for the arrangement of airport transfers.